. 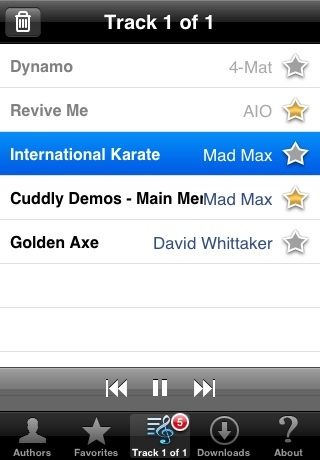 SC68 Player allows you to browse and play songs from the Atari ST SNDH YM2149 Archive on your iPhone or iPod Touch. The Atari ST music archive consists of old "chip"-music from games, and the Atari ST demo-scene that are in the public domain. A song is generally less than 10k and there is currently over 3000 songs available. Authors and songs by authors can be searched by using the quick search bar at the top of the authors list, and at the top of the authors song list. Tap the status bar to quickly scroll to the search bar. SC68 Player uses sc68 by Benjamin Gerard (Ben - The Overlanders), to replay sndh-files. The Core Audio replay is based on XCS by Anders Eriksson (Evil - DHS) and Elias Mårtensson (Loke - DHS). Both of these projects are released under GPL v2, and so is SC68 Player. The full source code is available for download from this site. If you are in need of support, have questions about SC68 Player, or have suggestions for more features to add then send me an e-mail.